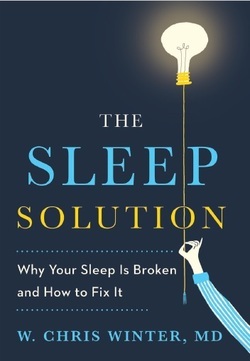 On April 4, 2017, The Sleep Solution: Why Your Sleep Is Broken and How To Fix It was released by PenguinRandomHouse/Berkley Press. The book was the #1 New Release for sleep books on Amazon as well as the #1 Best Seller in sleep books both leading up to an after its launch. You can order your hardback copy or audiobook via Amazon today or stop by our office to purchase a copy. Autographs or dedications, if desired, are always free. On April 3, 2018, the paperback was released and once again, the book was the #1 New Release for sleep books. You can buy the book on Amazon or wherever books are sold. Thanks to everyone for their support of this book! For more information about the book, awards and reviews, and bulk ordering information, please visit www.thesleepsolutionbook.com. Please Add Me To The Sleep Solution Email List. This will only be used to give updates about the sleep solution and Dr. Winter.